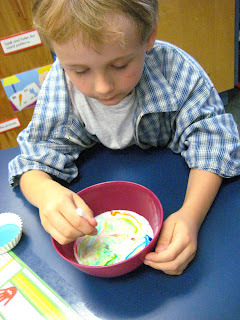 A Day in First Grade | First Week of School and a Science Experiment! First Week of School and a Science Experiment! Why hello everyone!! I’m so sorry that I have been MIA lately. This past week was my first week back with my new class and we all know how that goes! If I had it my way I would have been in bed by 7:30pm every night but alas that did NOT happen!! My class is precious this year. They are eager to learn and excited about school which is awesome. I had my parents fill out a “Getting to know your child” page and I was shocked at how many of them had written to me saying that their child did not enjoy school. Kindergarten (in my opinion) is supposed to be FUN! I taught kinder for 4 years and LOVED it. I could not believe how many of my students were coming to me wounded from their kindergarten experience. So, I upped my game even more than I usually do. I wanted to make sure that this class would have a fantastic first week and I would say it has been a success!! To give you a quick recap here are a few things that we did. On Tuesday morning the children entered into my classroom to find a bowl full of legos and a recording sheet on their desk. Their job was to sort the legos and then to color in the graph that went with the activity. Tuesday was filled with procedure games. Stand up, sit down… Line em’ up… Find a friend… and turn and talk. I introduced the whole brain method, “Class, yes” and “turn and talk” on this day. We also created some really cute Pete the Cats to decorate our classroom with. Wednesday we once again played lots of procedure games, named our class pet Peaches (a Beta Fish), Introduced the Phonics Dance, Math Bins, and completed a team building puzzle activity. Thursday we had our first edible estimation activity, introduced journal writing, read stories about David, talked about being a peacemaker in first grade, and practiced increasing our stamina during read to self. Friday was a fantastic day! 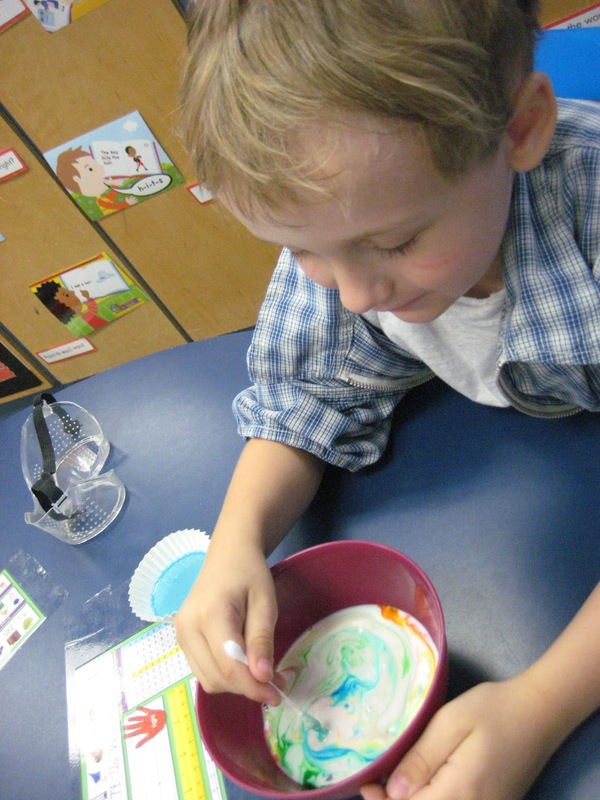 We had our first science experiment, had a Jello party and practiced journal writing and Read to Self again. To begin our experiment we created an anchor chart of what scientists are and what they do and then got decked out in our super special lab coats. Here are my little scientists ready for an experiment in their “lab coats” and their safety googles. I then demonstrated the experiment whole group as we talked about predictions. Then it was their turn! Then, dip your q tip into the center of the bowl and watch what happens!! I hope that you all are having a great weekend and enjoyed these pictures of my recap! Your students are so stinkin’ cute! I love that milk experiment and the last time I did it, my students gave me a standing ovation. 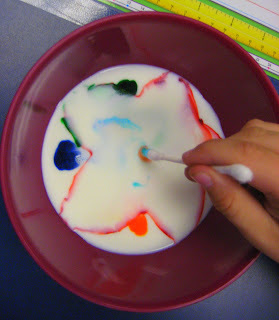 The one thing I learned, though, was not all food coloring is created equal. I tried one brand and it was a dud. Awesome! Welcome back! Do you only have 8 students? Please don’t make me jealous and say “Yes”! I have 33 first graders with no help! There’s no way I could do that experiment the first week of school….can you imagine?! So fun!!! I love all the activities that you did–I hope you get to bed at 7:30 at some point during the school year. What is the magic dough? Is it moon dough or a home made playdough?